Get the scoop on living in Seattle! The following neighborhood descriptions were written by UW law students. 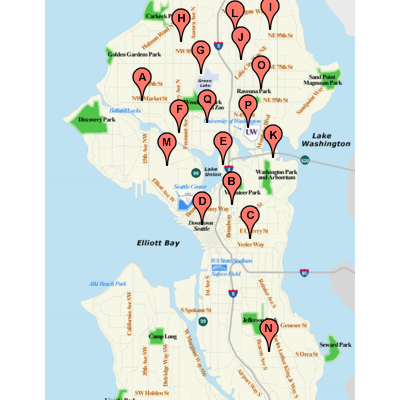 Some other good resources on Seattle neighborhoods are the Seattle P-I's Webtowns and Seattle.gov's Neighborhoods on the Net. Ballard is a great neighborhood situated just west of the University. An old Scandinavian fishing neighborhood, Ballard is right on the Sound. Transportation to/from Ballard is easy if you live close to Market Street, which is Ballard's "main street." The Metro bus route 44 goes directly from downtown Ballard to the UW. Ballard is a great choice for anyone looking for a real neighborhood feel a little bit away from the University District. There are tons of great shops, restaurants, bars and coffee shops. The only small caveat about Ballard is that it is a bit difficult to reach the major highways (I-5, Hwy 520) so commuting spouses or partners might have a longer commute out of the city. Founded about 1890, Seattle's Eastlake community is one of its oldest and quirkiest neighborhoods, located between the University District and downtown, flanking the east side of Lake Union. The Eastlake community is extremely convenient in getting to both school and downtown, with the bus commute taking 10-15 minutes to both locations (bus routes 70, 71, 72, and 73). There are many neighborhood parks, restaurants, bars, and shops that make it an active neighborhood. But the residential areas of Eastlake are also quiet enough to provide a relaxing atmosphere to live and study. Fremont is a relatively small neighborhood bound by Queen Anne to the south, Phinney Heights and the Zoo to the north, Wallingford to east, and Ballard to the West. This small neighborhood is centrally located to both downtown Seattle (5 minutes by car, 20 minutes by bus #5) and UW (5 minutes by car, 20 minutes by bus #44, 46). Most residences are located on the hill between 33rd and 46th Ave. N., and include a mixture of town homes, single-family dwellings, duplexes and small apartment buildings—all of which are surrounded by permit-free street parking. Local amenities include the ship canal, PCC Natural Market (a local organic grocer, akin to Whole Foods), Sonic Boom Records, and numerous bars with a lively nightlife, including several bars with live music seven nights a week. Fremont is also home to a weekly farmers market, the annual Fremont Fair (June 21) and Summer Solstice Parade, and the Fremont Oktoberfest (September 17-20). According to some students, Green Lake is the best neighborhood in Seattle. The law school is not too far away and the scenery is great. The lake is beautiful. Greenlake Park has a nice jogging trail, a basketball court, and softball and soccer fields. There are plenty of restaurants in the area as well. The neighborhood has pretty much everything you need. Restaurants and pubs surround the lake. Grocery stores are within short driving distance. Still, the neighborhood is nice and quiet. The south side of the lake is closer to the local bars. The rent is comparable to other neighborhoods. The people are slightly older (mid-twenties to mid-forties) than in the U-district or Ravenna. Generally, it's a great place to live. Greenwood is a quiet neighborhood bordered roughly by Aurora Ave N on the east and 8th Avenue NW on the west, between N 75th and N 105th Streets. It has a small business district centered at N 85th St and Greenwood Ave N. There you will find a variety of grocery stores, drug stores, coffee shops, pubs and neighborhood restaurants, and an abundance of antique stores. If you live on or near N 85th, bus route 48 is a 20 minute ride to campus; if you don't, plan on using some less convenient connecting routes or driving to a Park & Ride. If you're looking to buy, condos and houses are more reasonably priced up here than the ones closer to campus, but if you're looking to rent, prices will be comparable. The neighborhood is known for its blue collar roots, its mix of yuppie and kitsch, and its annual hot rod car show. One note: Aurora Avenue is a mostly-reformed high crime district, and there are a few lower-rent blocks nearby that might not be acceptable to the average apartment hunter. The Rainier Valley is one of the most ethnically diverse and rich communities in Seattle. Many new immigrants make their homes in the narrow valley that runs down Rainier Avenue South and Martin Luther King, Jr. Way in the South End of Seattle. The demographic breakdown of the Valley is roughly one-third Asian, one-third African-American and one-third Caucasian. The true breakdown shows a much richer diversity. On the block where one student lives, there are families from Mexico, Cambodia, Eritrea, Vietnam, Somalia, and Ethiopia living side-by-side in a traditionally African-American and Chinese community. There are estimates that between 50 to 70 different languages and dialects are spoken in the Valley. You can walk to eat at Mexican taco buses, pho noodle shops, East African restaurants and some of the best BBQ in the city. The best Philly cheese steaks in the city are here as well. Lake Washington and beautiful Seward Park are right over the hill. This community has traditionally struggled economically but is vibrant and constantly developing in an effort to improve. It is about as far removed from the University environment as you can get but is a great place for anyone who wants to see a different side of Seattle (i.e., the side you won't find in the Lonely Planet). Depending on where you are in the Valley it is about a 20-30 minute drive to the UW. The Route 48 Metro runs directly to the UW and multiple bus routes run downtown to connect to University bound express buses. Light rail service to downtown is scheduled to open in 2009. The Valley is a great place for those who want to live in a truly diverse and dynamic community. Wallingford sits west of the UW campus, stretching approximately from the west of the I5 Bridge to Stone Way and from Lake Union north to 50th Ave. Primarily residential, Wallingford has many multi-bedroom houses that students may rent, apartments in small apartment buildings, and single apartments. It is bordered by the Fremont (West), University (East), and Greenlake (North) neighborhoods. Getting to campus by bus takes approximately 10-15 minutes. The #44 runs about 3 times an hour from early morning till midnight while the #74 and #31 run only until 7pm. With the Burke-Gilman path at the south of Wallingford, you can also bike to school in about 10-15 minutes as well or walk in 20-30 minutes. The 16 and the 26 also provide easy access to downtown in about 20-30 minutes. Wallingford also provides easy access to I5 and WA 99. On 45th Ave, you'll a grocery store, drug store and a variety of restaurants and pubs as well as a movie theater and other shops. The neighborhood of Fremont is just west of Wallingford, also in walking distance, where there are more restaurants and activities. Gas Works Park, located in Wallingford on Lake Union, has a play area with large play barn, and big hill popular for flying kites. Special park features include a sundial, and a beautiful view of Seattle. Also close by is Greenlake which provides a 3 mile run/walk loop as well as a peaceful place to relax.